BEIRUT — In a country unable to elect a president, one man continues to reign as a self-appointed emperor. Michel Elefteriades is a well known and occasionally controversial figure in Lebanon, a former militia leader turned producer and king of Beirut’s nightlife. Having grown up through Lebanon’s civil war and seen his nation unable to shed the ghosts and divisions of its past, he is a man in search of a new way of doing things. 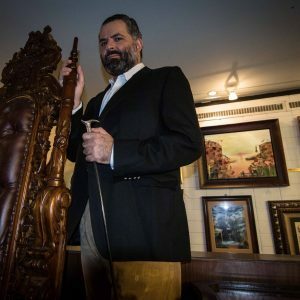 Sporting a cane and a potent sense of the absurd, step forward Emperor Michel E of Nowheristan – a nation with followers across the world. Redeveloped at great cost and controversy after Lebanon’s civil war, downtown Beirut is pricey paean to Lebanon’s wealthy. But amid the designer shops and glass swathed high-rise buildings lies a small den of the bizarre; a place where valuable antiques jostle for place with the kitsch and the worthless, and slogans compete for space on the walls. “Utopia Now” reads one, “People have the power”’ another. Here, in the HQ of Nowheristan, is one of the places that Elefteriades says he is trying to bring about change. Launched in 2005 in the presence of both a U.N. representative and the country’s then culture minister, the well-connected Elefteriadis decided he wanted to start a revolution. Since then, it is claimed, there are now one million Nowhereistanis from around the world – it’s as easy as signing up online. The ideals he espouses, listed in their own book, are universal, an embrace of diversity and rejection of inherited prejudices among them. But many have particular resonance in Lebanon, where an inability to elect a president is just one manifestation of a country deeply stifled by its sectarian divisions and still largely run by its old war lords. It is not surprising that Elefteriades is passionate about the dangers of not moving on from a violent past. He witnessed, and participated in, that past himself. As a “sensitive” teenager growing up in an area controlled by Christian militias during the civil war, which spanned from 1975-1990, Elefteriades made the mistake of going public with his interest in communism. It is something, he says, that led to his torture at the age of 14. Drawn into the politics of the war from then on, he eventually led his own militia. He says he has no major regrets regarding his past. But the end of the war in 1990 saw him exiled, living variously in France and Cuba, before returning in the late ’90s. Having sworn off politics, he made the fateful decision to go into music, producing an array of hits and gradually building a formidable business empire. Along the way, he has created another utopia of sorts, albeit a rather profitable, hedonistic one. 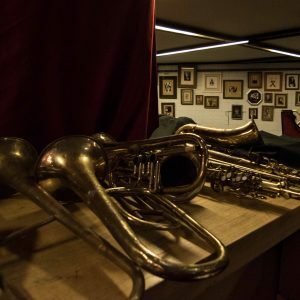 His two Music Hall venues are among Lebanon’s best known nightlife spots, showcasing fusion music that has upset traditionalists and won him loyal fans. He has expanded into Dubai and had plans to go global. 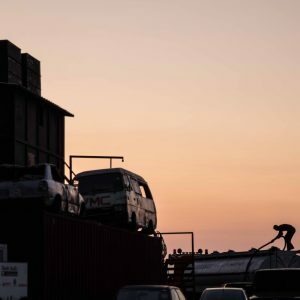 He speaks of both the venues and blending of cultures in his music in ideological terms, describing the motivation behind launching the second Music Hall in 2013 as a reaction to the escalating Syrian war. “I said I’m going to create a kind of bunker – an oasis of music and culture – and I will protect it,” he told VOA. Of course, he also returned to politics, though he claims to be scornful of politicians. A participant in last year’s You Stink protests, sparked by the country’s trash crisis, he is downbeat about how the movement dissipated. Though trash is once again building up on the streets, the mass participation movements of last summer seem a distant memory. And while Elefteriadis may have friends in high places he clearly has enemies there too. He is still awaiting a court case over allegations of satanism, a charge the Elefteriades, an atheist, vigorously denies. Perhaps in keeping with the Nowheristani embrace of contradictions, with Elefteriades it is hard to separate the canny businessman from the utopian idealist, the man from the well-constructed myth. Meanwhile, when it comes to Lebanon and its divisions, he is adamant. “All these things are going on too long”, he tells VOA.